A nice, cosy and quiet place to spend a few nights in Agios Nikolaos, if you don't mind walking 10 - 15 minutes to the Centre and/or the beach. Just 6 minutes to KTEL bus station - this was a big plus for us since we were here primarily to visit places and hike (gorges like Kritsa nearby). The owners are pleasant company and the apartments are fantastic. Really spacious and comfortable, and they also have huge terraces in front. The complex has a small pool (if you're in the mood for a bath and too lazy to go to the beach) and a pool bar (where you can also serve a quick breakfast). Litsa was very welcoming and gave us lots of useful information about the area. The apartment itself was perfect for a beach holiday stay and the pool was a great addition. The centre of town was only a ten minute walk away. The appartment was very spacious and well equipped. We found the washing machine in the appartment very useful. The owner was very helpful in giving us information about what to visit. Easy to park in the street in front of the hotel. The owner lady was so friendly and kind. The room was spacious and extra luxury was washing machine in the room. We really need it after travelling two weeks. The location was perfect:peaceful property and only 15 minutes from the center by foot. Bus station was also near, 5 minutes' walk. Nearest supermarket was in about 10 minutes by foot but there was a kiosk where you can buy water and other refreshments, few minutes by foot. We picked this spot as my partner had to catch a bus at 6.00 a.m. A seven minute walk away. Very friendly staff. Nice pool. Close to town but in a quiet location. Staff were very helpful. Will go back again. Lovely hotel with a mountain view and close to the center. Really welcoming and friendly staff. Clean room. Nice swimming pool. Good breakfast. Great place and great hosts. Nice, clean and good value for money. They met all our additional requests. We will come back. Lock in a great price for Manos Apartments – rated 8.8 by recent guests! Manos Apartments are situated on a quiet hillside, overlooking olive groves and mountains. 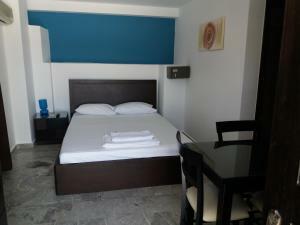 Just half a mile from central Agios Nikolaos, they are an ideal base for a relaxing vacation. 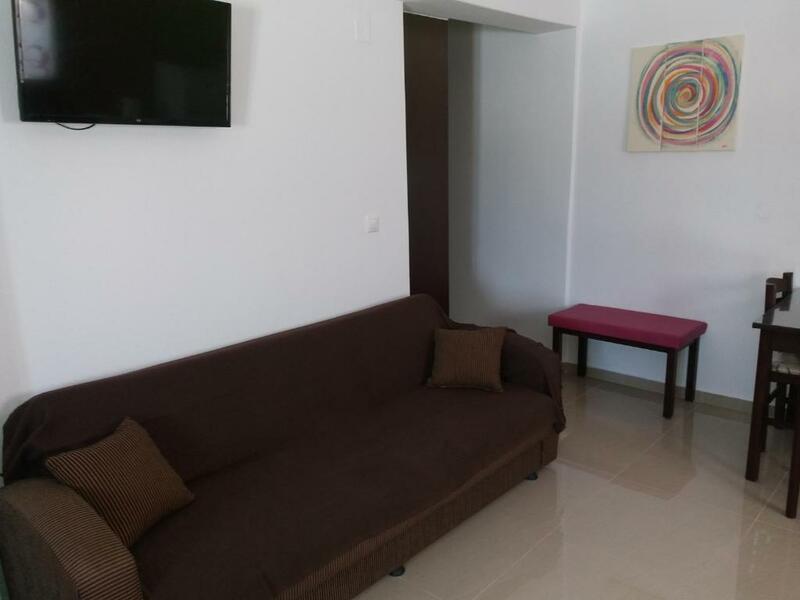 The friendly, family owners of these apartments offer spacious rooms, equipped with private balconies. Enjoy the stunning views of the mountains from your own balcony. Relax by the outdoor pool and soak up the Mediterranean sun. With a snack bar that stays open as long as you need it to, the warm and personal service provided here will make you feel completely at home. 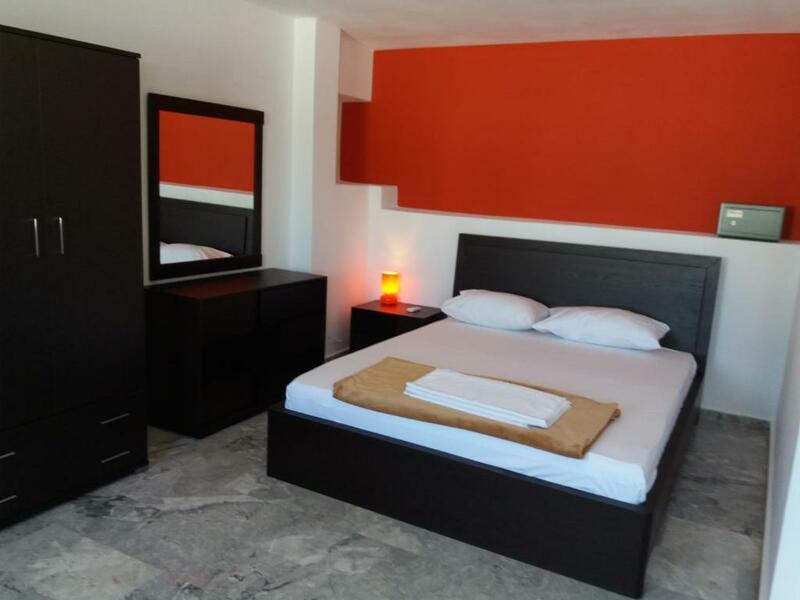 The apartments are just a 15 minute walk from town, with plenty of taverns and restaurants serving local delicacies. There are also water sport activities available at the beach, just a mile away. For those who want to further explore this beautiful area of Crete, the hotel offers free parking. 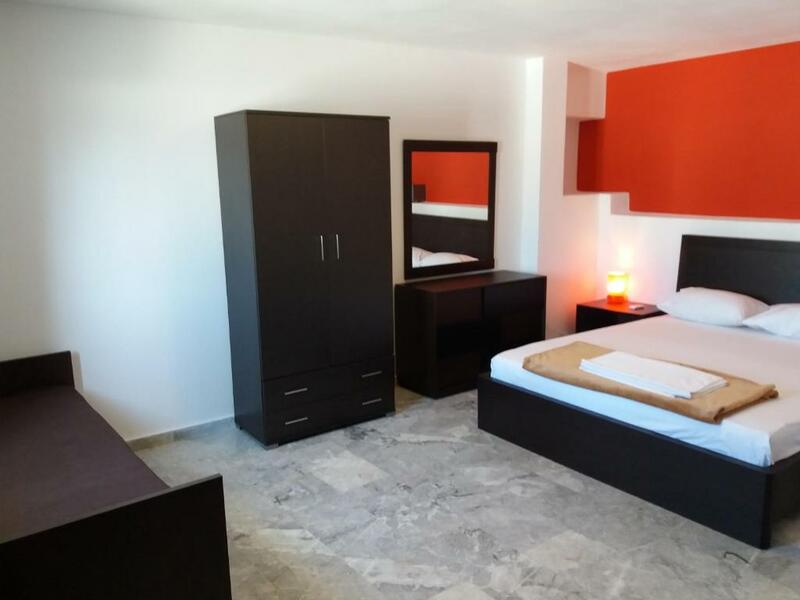 There is also a bus station just 850 feet from Manos Apartments, with frequent buses to the surrounding villages. When would you like to stay at Manos Apartments? 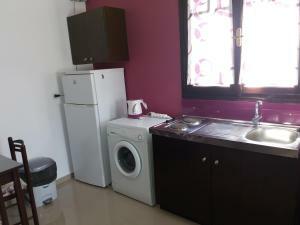 Air-conditioned studio with kitchenette, balcony and TV. This air-conditioned apartment consists of a separate bedroom and a kitchenette with dining area. 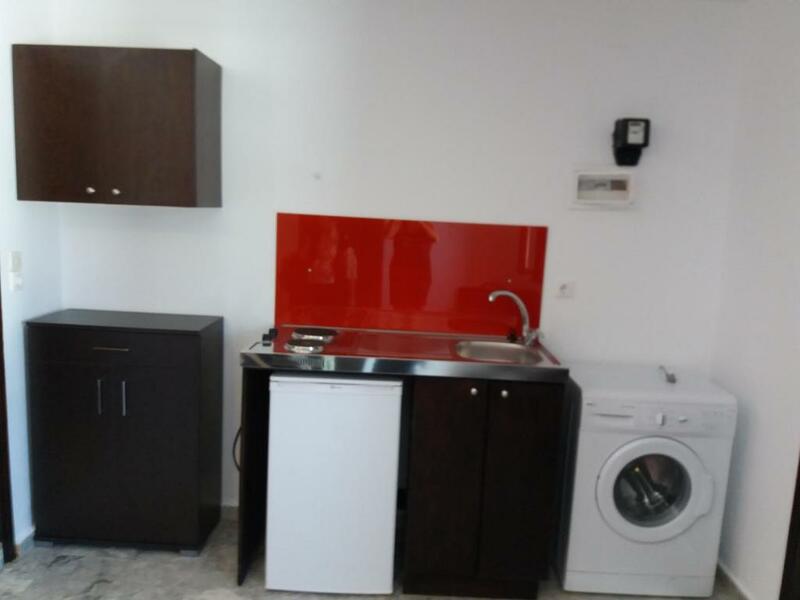 A washing machine, a fridge and iron are available. This apartment has a dining area, kitchenware and patio. House Rules Manos Apartments takes special requests – add in the next step! Up to three children under 16 years are charged EUR 8 per night when using existing beds. Manos Apartments accepts these cards and reserves the right to temporarily hold an amount prior to arrival. The calm location is not really central, but town center and beach within a 10 min walk reach. No shops, cafes, restaurant in the neighborhood. The room was not cleaned during our two-night stay nor were the towels changed. The kitchenette was not fully-equipped: no sponge and soap and dirty dishes in cupboard. Breakfast was not good for us because we are used to enjoy a varied breakfast : only bread, ham and cheese toast, marmelades, chocolate croissants and hot/cold drinks. The rooms weren't properly cleaned every day. Quite a lot of steps to our apartment so not ideal if any mobility issues. Incredibly hospitable, helpful and friendly - even served us a beer when we arrived very late at night. 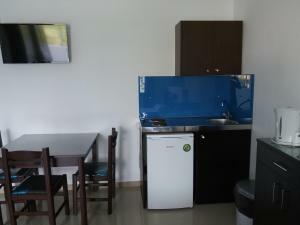 The rooms are clean and pleasant and excellent value for money. The pool looks great and food was good although we didn't spend much time there as we preferred the beach. Great coffee. Pillows too hard for me. Shower not the best. The (massive) terrace was shared and a little trellis or movable partition of some kind would have been nice. Great little place though! Litsa was great and nothing was too much trouble! Our flight was going to be late in anyway but was then delayed 2 hours so we arrived at about 4am. We were met and shown our rooms with no problems at all. Couldn't give us late check out as was full but gave us as much extra time as she could and also gave us use of the shower/wc room by the pool to store suitcases and get ready for departure. Clean everywhere, good air con, good (personal) WiFi for the room, nice pool, basic but new interiors, kettle, washing machine, washing line,stove, fridge (little freezer section) kitchen sink, crockery/glasses, indoor table and chairs and outdoor, huge terrace but shared between 2. Bonus-next door's kittens. Its a ten minute leisurely walk to the beach, bars and town. Can be easily done to enjoy the beach come back then head out when it gets cooler to enjoy the restaurants. We didn't have a Netflix day (100% lovely weather) but the flatscreen in the room had a HDMI and it's own personal WiFi hub so I think it was doable. Views of mountains (and the sea from the terrace).